I thought that it would be interesting to share with you how we do some of our more hands-on lessons. 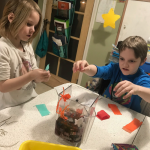 To give you a little bit of a backstory, we do a lot of hands-on lessons as well as a few unit studies, some workbooks, and a few online programs. We don’t really stick to one particular thing and we just go with the flow of what we are interested in. This year we have been focusing on Ancient Time, we mostly follow Story Of The World for our baseline and then we just spread out from there. 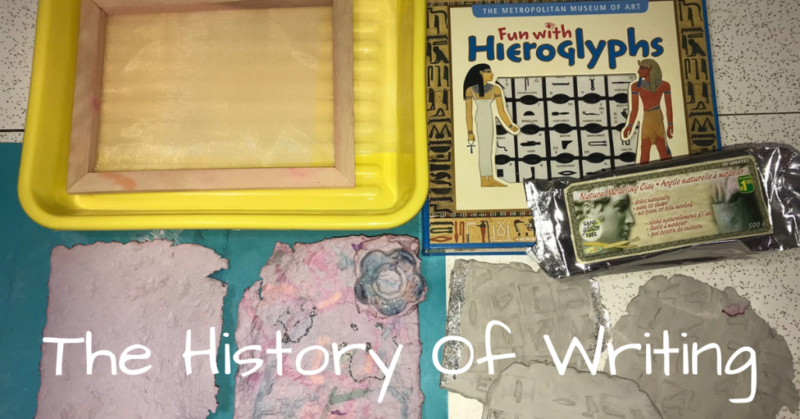 So now that you kind of know how we operate, this was a lesson that we did about the history of the written word. We started off this lesson by watching a couple of videos that I found on youtube. Two of these videos were just really short and to the point, the other was a bit longer but the kids really enjoyed learning all the little facts. Here are the three videos that we watched but you could also just search for your own. The History of Writing – Where the Story Begins – Extra History – This is a short yet very educational video about why writing started as well as how people wrote at first. How writing went from little pictures to actual characters made up of lines. Thoth’s Pill – an Animated History of Writing – A bit longer than the last video but the kids still really enjoyed this animated history lesson about writing. The characters are cute and the storyline is easy to follow. If you’re only going to watch one of the videos I would highly recommend this one, it has everything you need to know in 45 minutes! GEN 140 – The Evolution of Writing – More of a lecture type video with a man that tells you information. I thought that is was really good as far as telling you all the info. My son who is eight years old really enjoyed it, my five year old not so much. After watching the videos is where the rest of our lesson began. We used clay and a toothpick as well as stamps with hieroglyphics on them to make our clay tablets. 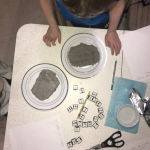 It was pretty straight forward, we just used air dry clay, flattened it out on plastic plates, and then stamped into the flattened clay. The kids and I really enjoyed it, we made secret messages with the hieroglyphs. 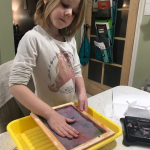 Next, we used a paper making kit that we picked up sometime last year to make our own paper. You blend a few sheets of plain paper or newspaper with four cups of water and then strain in a pulp strainer, which is basically just a screen attached to a wooden frame. You pour the pulp into the screen, push out all of the water, and then let the paper dry. It was super messy but the kids really enjoyed it and I don’t think they’ll ever forget how paper is made! Looks like a lot of fun. We have been studying Egypt the past couple of weeks and have a hieroglyph activity to do next week. 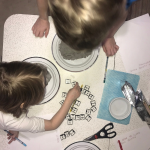 The kids really enjoyed actually using them rather than just seeing them or hearing about them, I’m sure you’ll have lots of fun with the hieroglyphs! 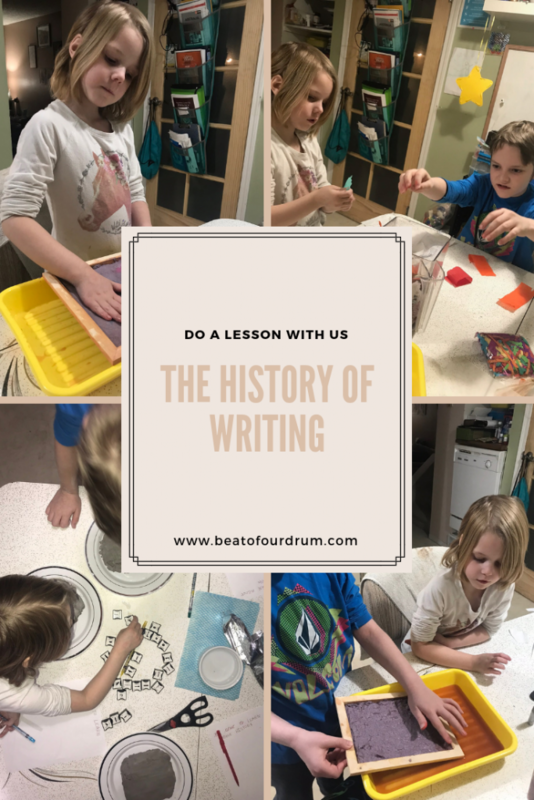 Great hands-on lessons about writing! How fun! Yes, my son who isn’t a fan of writing was very thrilled! Another fun activity you might want to try is carving into plaster of paris. I remember doing this as a kid. Make a “tablet” our of the plaster using a plastic container as a mould (we made ours about an inch thick). Once it is dry, you can use an assortment of tools to carve into it and see what works best! Oh yes, that would have worked well too! I just used what we had around the house, but great idea!